Wine tasting in Santorini has grown up in recent years and no place has demonstrated it more clearly than the cafe and tasting area at Santo Winery. 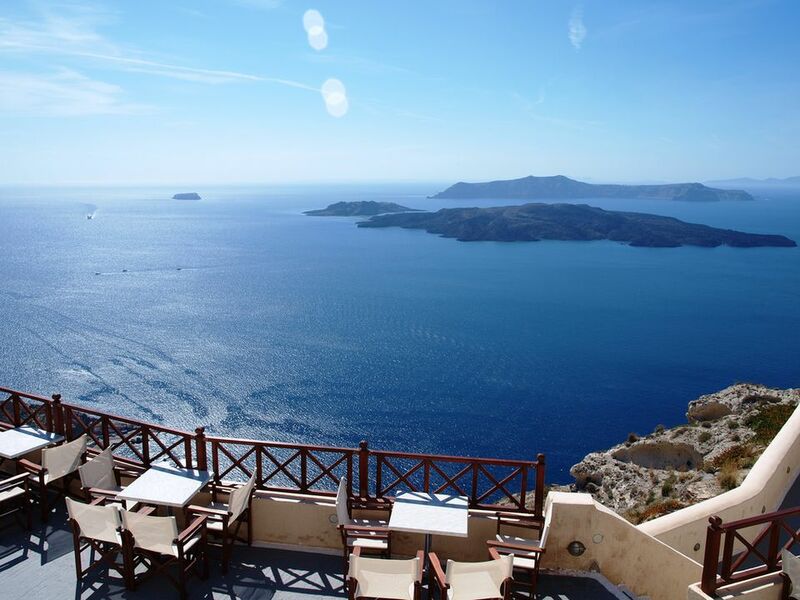 With a world-class view from high above the famed caldera, this is a very worthwhile stop during your adventures on the island of Santorini. The location is a terrific place to view the sunset, offering a different angle on the caldera. But if you're going to Santo in the late afternoon or evening, be aware that its elevation above the cliffs can make it a bit windy. Like all wineries of Santorini, the bottles here benefit from the unique growing conditions on the island. The rich volcanic soil contributes a distinct tang to wines grown here, and the unusual "basket" style of training the vines to protect them from the prevailing winds also plays a part. Santorini is blessed with a number of local varietals, including the popular assyrtiko grape whose ghostly paleness delivers a deep dose of minerality to the wines made from it. On the darker side, the deep red "vin santo" wine was originally produced for use in the churches, and its rich sweetness makes it an ideal dessert wine which also shows up in some modern Santorini cooking. Santo presents a number of wines from various collective members, so the selection is extensive. While at the winery you can enjoy a film about the Santo winemaking process at the Oenotourism Center. The Center is open from 10am until sunset, April through November. With a large open terrace area, Santo Winery frequently hosts wine and food events, among them the now-annual "Cities by the Sea" wine and gastronomy festival. It's also a popular location for weddings and other events. Obviously, Santo would be delighted to send you home with any quantity of wine. Santo Winery is easy to get to from Fira - just drive south from Fira, following the signs to Perissa. About 4 km or 2.5 miles from Fira, you'll see the flag-adorned winery to your right. Parking is free. The winery is sometimes closed for special events, so you may want to give them a call in advance just to make sure.